The Real Unknown is a term that Lewis and Clark noted in their journals as they left the last settlement bordering the then-unexplored western territories of the United States. Embodying this concept and expanding upon its use as a metaphor for unanticipated discovery, this project delves into the contemporary American landscape, focusing on real estate sites. While making work in and around suburban spaces I began taking note of signs at the edges of undeveloped property, declaring future use and value. Conjured by developers and real estate agents, these placards typically offer detailed descriptions used to sell the property. This view of natural space presented in stark, commoditized terms stood in contrast to my personal feelings about nature and land use. As someone who enjoys overgrown lots and untouched landscapes the thought of these parcels being developed, in an all-too-familiar fashion, immediately fueled my desire to begin photographing them before they were gone. I am using the descriptions as titles for each piece, finding that they function as a blatant and powerful counterweight to the inherent visual quality of these spaces. They are a potent example of an altered perception of the American landscape, one that has gone from uncharted wilderness to a parceled, divided and mapped terrain, in only a few generations. 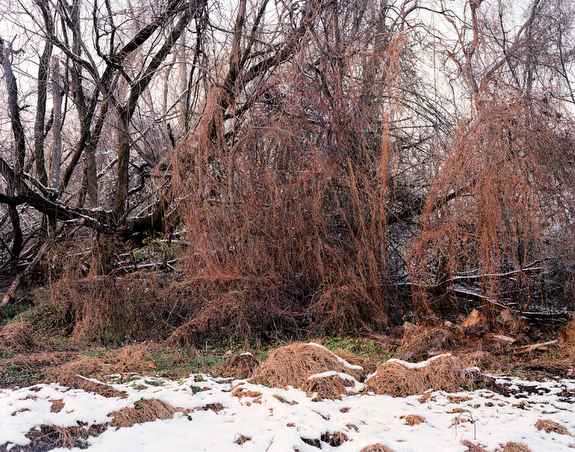 Turning back to the land itself, The Real Unknown explores relationships between the insatiable urge to constantly alter our landscape and the often-indescribable allure of the natural world. For some, these spaces represent pure commodity, another opportunity to profit from the unceasing development of America. However, spending time in these places has given me a different perspective. I see an untouched world with sublime and contemplative qualities — one that holds mystery, still offers the potential for discovery, and challenges our understanding of exactly what it is and should become.